Editor’s note: This is the second in a two-part miniseries highlighting driver sleep. On Tuesday we highlighted the importance of quality sleep and info on our sleep apnea program. Unless you’re a truck driver with daily home time — Schneider has those opportunities, too — you’ll need to master the art of sleeping while on the road (between the times you’re driving; not while driving, of course). 1. Where do truck drivers sleep? If you mean, what locations do they sleep in? That depends. Company facilities, truck stops and rest areas along the route or near the delivery location are the most common areas, but some customers will allow drivers to park and sleep in their parking lots. Locations that truck drivers can sleep will be discussed during Schneider’s orientation for new drivers. If you mean, do truck drivers sleep in their trucks? It depends, too. There are two basic types of tractors: Day cabs (no bunk in the back) and sleeper cabs (single bunk or double bunk in the back). Drivers who are away from home for one night or more will drive a sleeper cab with a bunk space (or sleeper berth) behind the seats. Some trucks, namely those for team drivers, have double bunks. 2. How many hours of sleep do truck drivers get on the road? According to the Federal Motor Carrier Safety Administration’s (FMCSA) Hours of Service (HOS) rules, drivers may drive a maximum of 11 hours after 10 consecutive hours off duty, and may not drive beyond the 14th consecutive hour after coming on duty (which includes non-driving time for unloads, pre-trips, post-trips, fueling, etc.). That gives drivers plenty of time for sleep, but each driver needs to make his or her own decision to get a proper night’s sleep. At Schneider, we always tell drivers you’re the captain of your ship. The exact amount of sleep needed will vary by individual, but quality sleep is crucial. According to a National Transportation Safety Board (NTSB) study of fatal-to-the-driver crashes, fatigue was the principal cause in 31 percent, the biggest cause. For tips on fighting fatigue as a driver, check out these North American Fatigue Management Program (NAFMP) modules. 3. 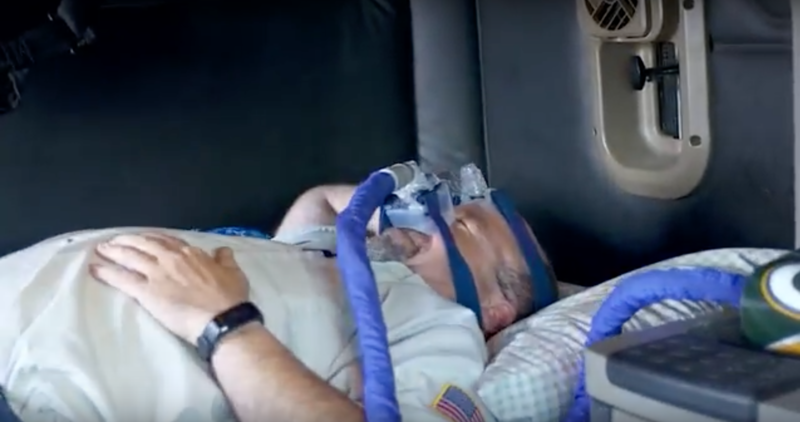 Do truck drivers need to be tested for sleep apnea? We covered everything truck drivers need to know about driving and sleep apnea on Tuesday. 2. Use foam earplugs – If you’re stuck between two reefer (refrigerated) trucks, it could be a long night without a little help from ear plugs. Just make sure you have an alarm solution that works if you need to be awake by a certain time! 3. Use a mattress topper and/or comfortable blankets/pillows – The more comfortable the bed, the better you can sleep. 5. Be careful about naps – If you need to stop for a nap for safety reasons, please do so. We recommend limiting naps to 30-45 minutes to take care of fatigue without throwing off your circadian rhythm to the point it interferes with your longest stretch of sleep. Drive for a company that cares. We put our drivers’ safety first and always. 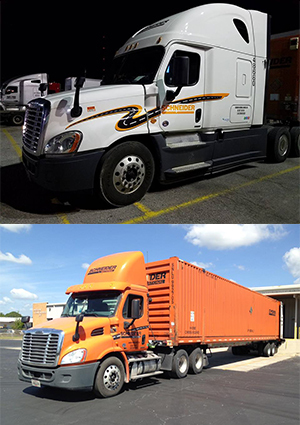 At Schneider, we tell our drivers to do what they need to in order to operate safely while out on the road, and we’ll do the same with you. Now it’s your turn to sound off. Where do truck drivers sleep? How many hours do you get in a night? What’s your best advice for getting great sleep while on the road? Comment below.